The CD123 antigen, alias Interleukin-3 alpha receptor (IL-3Rα), belongs to the cytokine receptor family. 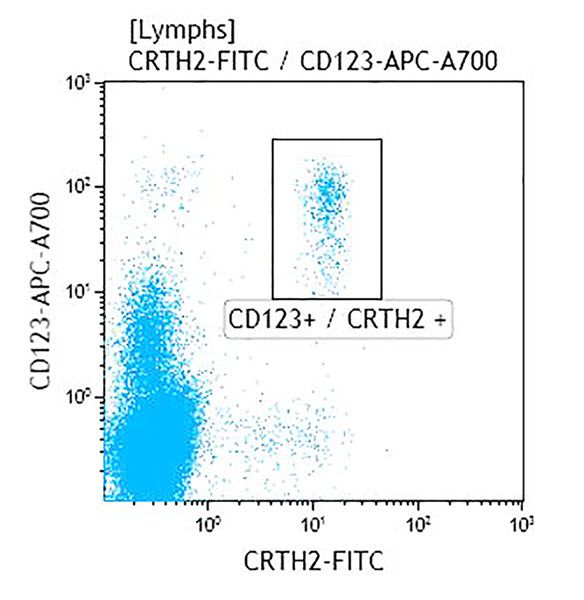 It is constitutively expressed by committed hematopoietic stem / progenitor cells, by most of the myeloid lineage (CD13+, CD14+, CD33+, CD15low), and by some CD19+ cells, it is absent from CD3+ cells. *Alexa Fluor and Pacific Blue are registered trademarks of Molecular Probes, Inc.